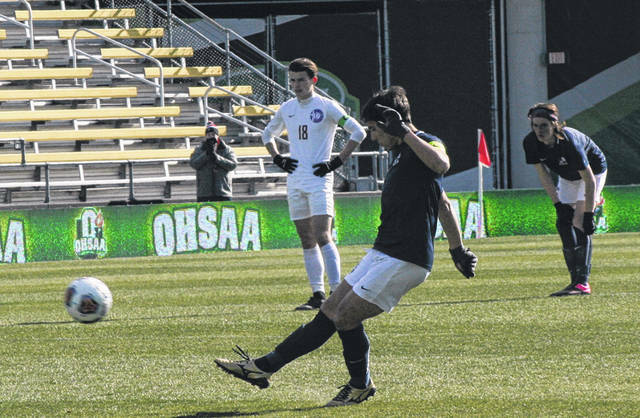 Trey Theobald of Archbold (17) and some of his teammates celebrate his goal early in the first half of Saturday’s state championship game. The Blue Streaks defeated Dayton Christian 2-1. 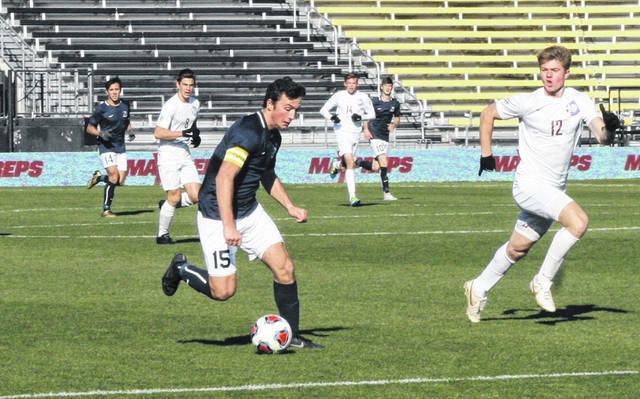 Andrew Hogrefe of Archbold drives the ball upfield during the state final Saturday. He assisted on the team’s go-ahead goal in the second half. Josh Kidder of Archbold boots a free kick toward the net. Teammates Clay Gerig and Sonson Nafziger (7) embrace after the Blue Streaks won the title. COLUMBUS – Head coach Sean Stewart has seen a lot after nine seasons of guiding the boys soccer program at Archbold. 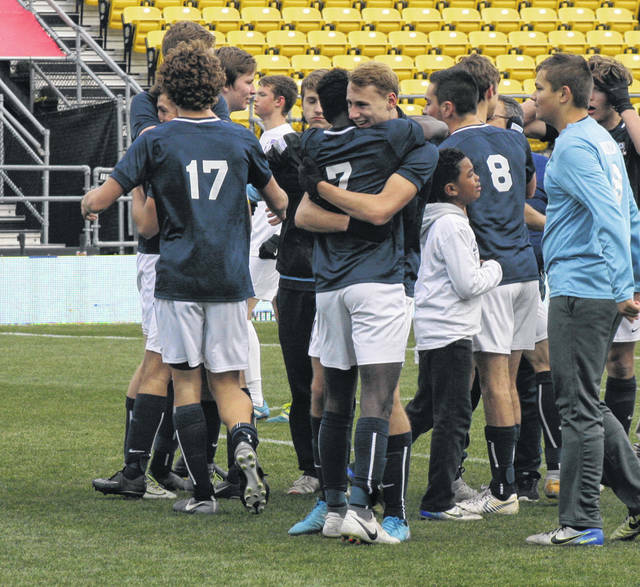 All their hard work paid off Saturday at MAPFRE Stadium when the Blue Streaks captured a Division III state championship, 2-1, over Dayton Christian. “It’s incredible,” said Stewart. “It’s a culmination of so many years of hard work. The program’s nine years old, and our alumni have helped to bring this program up. These players here have finished off the job in getting a state title. As with many of their games this season, Archbold got on top early. Senior leader Josh Kidder swooped in from the left side, dishing to Trey Theobald, who slipped one past Warrior goalkeeper Paul Socha for a 1-0 lead three minutes in. The Streaks did have more opportunities in the first half but they were turned away. At the 33:45 mark, Hogrefe fired one from inside the penalty area that missed to the left. Then, Kidder backed up Socha deep into the Warrior net on a free kick from 30 yards away, only to have the keeper haul it in. This kept the margin at one, with just over 20 minutes before halftime. The Warriors really started to put the pressure on in the latter stages of the first half. Their attack eventually drew a penalty kick, as Noah Alexander banged it in the left corner of the net to tie the game with 11:24 to go. Once again, Archbold would go ahead in the early stages of half number two. 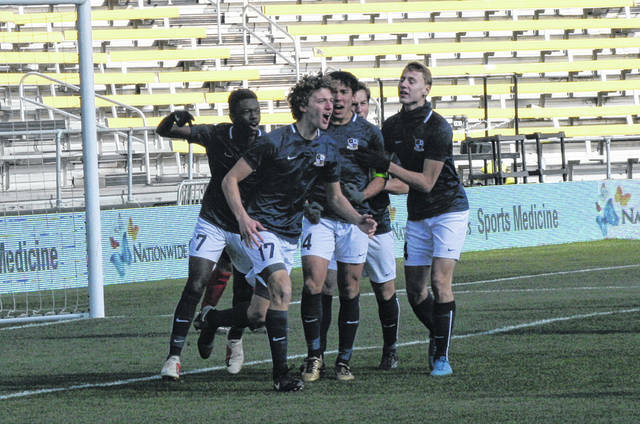 Just two minutes and six seconds after intermission, Hogrefe crossed a free kick to a waiting Elijah Zimmerman, who headed it in for the go-ahead score. Cheney was the biggest in the final 30 seconds, when he deflected an initial shot, then fell on another to keep the Warriors off the board. Archbold ends the season at 22-1, with their only loss coming to Ottawa Hills in the regular season on Aug. 27. During the tournament, the Streaks knocked off three teams (Ottawa Hills, Independence, Dayton Christian) ranked higher than them in the state. The Streaks ended the season with 148 goals scored, a mark which put them at fourth all time in Ohio – in all divisions – for goals scored in a season. It was more than any team since 1984.